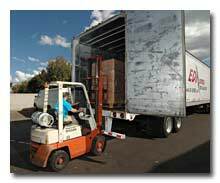 We utilize all shippers and carriers to save you money. We utilize all methods of getting your product delivered to your customers including UPS, FedEx, USPS, DHL, and most common carriers. Typically 99.9% of our customers use UPS for their shipping requirements due to their highly competitive pricing. UPS has introduced a special service called UPS Mail Innovations, which allows us to use UPS to fly your small package to a city destination and then moves the package into the United States Postal Service for local delivery; allowing you to appreciate even bigger savings in shipping costs. We can track your package once it has shipped in most cases. With our automated shipping software, we create bar code shipping labels for all your products insuring that the product is delivered in a timely manner to your customer. Then, using the latest technology, we track your product from the time it leaves our door until it is safely delivered to your customer. No matter what type of product you have we can ship it, track it, and get it to you customer on time. Pick & Pack is an important part of our shipping and fulfillment services. Our Pick & Pack services dovetail closely with our order processing services. For more details on our order processing services please visit our order processing page. Once your daily order batch has been processed and downloaded (typically between 20 to 2,000 orders per day), a pick ticket is generated for each order. The pick ticket will tell the Pick & Pack crew what items are to be included in each order and the item's location in the warehouse including the aisle, shelf or pallet location, and even the bin number of the merchandise. Our crew "picks" the item and then takes it with the pick ticket to the packing department. In the shipping department, our quality control team will check the merchandise a second time against the pick ticket for accuracy. The order is then passed to the shipping department where the accuracy of the order is checked a third time and then finally cushioned and packed for shipping. The packer will select the appropriate shipping container and safely pack the container selecting the correct box and cushioning materials to assure that the merchandise arrives without damage. As part of packing process, a bar coded shipping label is applied for the proper shipper. We use bar code package tracking for both UPS and USPS when available. The availability of tracking is determined by the weight class and carrier. Additionally, if you need help with the design and creation of custom packaging for your merchandise, we offer special print and package design services that you may want to consider. Find out more information. We offer more than pick & pack services – we move containers and pallets too. Use Medallion Fulfillment & Logistics for your third party logistics (3PL) needs. When you are shipping less than truck load amounts for business to business (B2B) and business to consumer (B2C) sales, we have great options to save you money using our preferred carrier network. Pallet and container shipping of large quantities can be very cost efficient and we are set up to help you take advantage of these type of LTL shipments with our third party logistics (3PL) services. When you need a 24 hour turnaround for shipping of parts or other crucial deadline sensitive items, we have special services for your special needs. We offer courier pick up and drop off services in the Los Angeles area 24 hours a day. Need a part or item on a plane in the middle of the night? We provide "counter to counter" airline services and even special courier services that can meet your private plane at any Los Angeles regional airport. Got a crucial computer server down at a east coast branch office? We'll get it to your private plane or commercial plane on time, any time of the day or night. We routinely provide this type of specialized time sensitive courier handling service for airline parts manufacturers. We frequently transport parts to waiting pilots or airline counters at any of our airports in Los Angeles, even in the middle of the night. If you have a special need like this, ask us, we can handle the logistics for you! We can provide light assembly and kitting work for your products before they are shipped to the consumer. Assembly and kitting services are preformed based on pre-contracted rates based on your specific needs. Our warehouse assembly and kitting services allow you to import product pieces from low-cost production global markets and then allow us to assemble or package them into your end product before shipping to your customer. Contact us for more detailed information based on your specific needs today. Special Shipping and Warehousing Needs? Do you have special storage and shipping requirements? Call us at 818-998-8366, we can help. We have several warehouse locations and one even located near the Port of Los Angeles to make global fulfillment services and global container shipping a reality for your business. We want to be your global fulfillment resource. We provide comprehensive full service for Internet stores and eBay stores. We handle monthly reorder fulfillment and subscription-based services as well as trade show literature fulfillment.